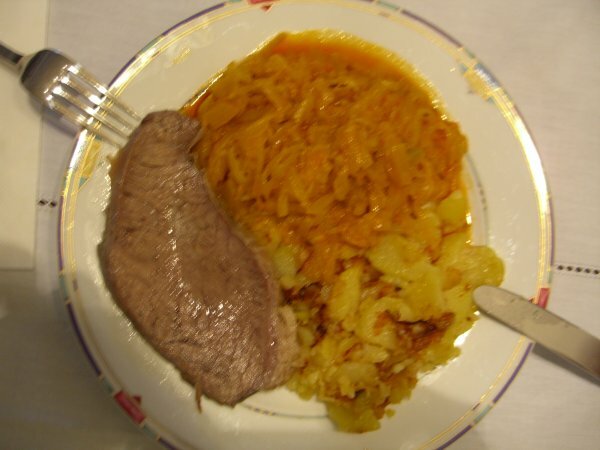 The meat on the left is Tafelspitz for which my dictionary only gives a translation of prime beef boiled. This you can find everywhere in eastern Austria. But the more important part is the pumpkin stew here as a side dish which makes a good main meal by itself. This style of Styrian Pumpkin I love and it was cooked for me by my mother on 45th birthday. Styrian Pumpkin It is from the official Styrian government homepage, the design is a bit stern. But what their recipe does not tell you is that the pumpkin dish is best cooked not with butter but with pig fat. This makes the difference in taste but is not likely to be savvoured by everyone the same. Sounds delicious...I will try to make it this week as a friend is coming over for dinner...(minus the pig fat, which i doubt i can get here). 2 Qs -- any idea how long the beef is boiled for? i am guessing it is simmered for hours ?? what is the yellow food next to the pumpkin -- apple? potato? something else? ps it is really interesting that the Styrian government value their local food so highly that it features on their webpage ..are the austrians as obsessed by food as much as the italians, only in a quieter, more *private* way?